The #RNCinCLE hashtag has exploded on Twitter, as everyone from pundits and politicians to citizen viewers have been weighing in on the Republican National Convention. Day One of the convention was full of excitement; we saw a long-anticipated floor fight sparked by the Never Trump movement, which made a last-ditch effort to change the nomination rules in a way that unbinds them from the results of the primaries —an effort that, once again and for the last time, failed. We also heard a bunch of super intense speeches in honor of the night's theme, "Make America Safe Again." 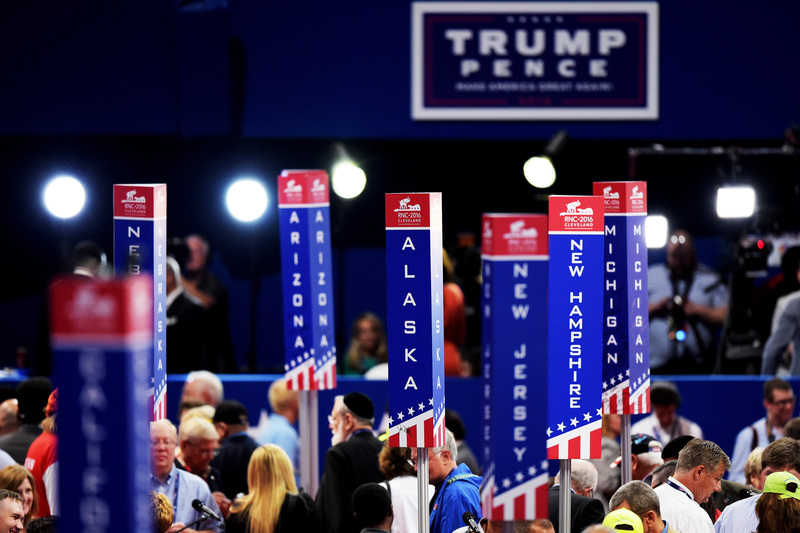 There was no shortage of material to discuss, and Twitter users made use of the platforms' emojis during the convention to not only tell, but show others how they felt about the proceedings. American pride reigned supreme among emoji-using RNC tweeters, according to Twitter's internal data; the American flag emoji scored the number one slot for Monday. Second place went to a likely less supportive emoji — the "laughing so hard I'm crying" emoji. Given the general dearth of light spirits and joking at Monday's event (save a few pantsuit cracks at Hillary Clinton's expense), Twitter users probably weren't laughing at something meant to be funny. In third place, we have the double exclamation mark emoji — not surprising, given the number of surprises Donald Trump has brought to the race. In fourth place, we have an interesting choice: the finger point. This could be in reference to Trump's emphatic manner of pointing at his wife Melania as he introduced her before her keynote speech. The remainder of common convention feels expressed via emoji on Twitter Monday indicate positive vibes. In fifth we have the heart, followed by a steam locomotive — possibly indicating that the right was hopping on the "Trump Train" the day preceding his official nomination. Next, we have the basic thumbs up, a classic expression of approval, though it can be used sarcastically. Coming in eighth place, there's the flame, which can be used in a couple different ways. Some tweeters may have found aspects of the convention to be "lit"; but others probably used it during the walk-out of several Never Trump delegates following the fight over rules changes, to indicate that this thing was burning to the ground. Clapping hands and a proud gold trophy finish of the top-10 emoji list. Emotions around the 2016 Republican primary and the convention have run high, and emoji use is keeping pace.